SC Support and Care Services have played a vital role in supporting our son through his NVQ2 and CIEH2 to obtain his Certificates. They were able to support him for the written part of each of these Certificate courses and also in his work place as he prepared and undertook the various Assessments. They are also actively involved in helping us to identify any possible future placements for our son in a workplace, where he will be able to use his hospitality and catering skills, in a supportive and caring environment. SC support and Care Services have also played an essential part in supporting him with his health issues, and support him weekly to get advice on healthy eating and exercise at a local gym, as well as enabling him to go for eye testing and other medical appointments. SC support him both at home and when he goes to respite placement, if we his parents are away. This has been good for our son in experiencing another supportive model for supportive living, and because of the continuity of carers whom he knows and trusts, he has gained confidence in allowing us to have respite breaks away from him. Travel training, visits to visit his Grandmother, encouraging appropriate interaction attending social events, such as Night club, his Church in London and help in managing his finances, have all been skillfully undertaken under the excellent management of Sophie Chung and her team of dedicated and highly motivated staff. They are able to work with flexibility, adjusting to changing needs and are always available to respond immediately to unexpected needs at critical moments as well as putting in place a regular programme of focused managed support. We could not have managed our son's needs without the weekly support, or daily support when we are away, and are thoroughly satisfied with the truly professional and outstanding care, which SC Support have given to our son, and the progress and maturity are testimony to the success of their care strategy. We need this to continue at this level, without which our son would be exposed to unsustainable vulnerability. Since SC Support started caring for my big brother 13 years ago, his quality of life has improved so much that it’s fantastic. Living 200 miles away, helping my brother cope just with day-to-day matters was exceedingly difficult, let alone anything else. 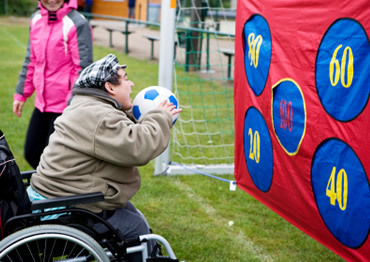 From the daily chores, to the opportunities he now has with various clubs and activities that keep him active and motivated, he lives as independent a life as is possible. They are always there for him and in difficult times have supported him (and myself) sensitively and have gone the “extra mile” to help. I am full of gratitude - I cannot thank them enough for treating him as an individual and cannot recommend SC Support highly enough. “The support being received is working extremely well… independent scores have doubled between assessment dates, prompting has tripled whilst assistance has more than halved and dependence has also reduced… and he continues to gain in experience and subsequent self confidence.” Occupational Therapist review findings regarding one of her clients who we have been working with. Mr M (client with learning disability) “I am very happy with the support I have been receiving since November 2008. It has helped my confidence a lot and has been very beneficial. This has been my first lot of cooking since college in 1996! !